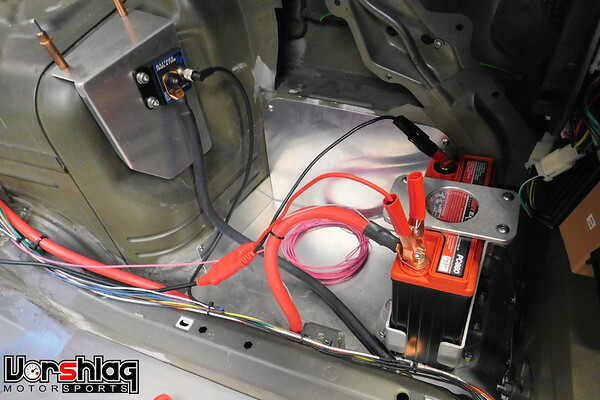 The Cartek XR Battery Isolator is a solid-state electrical master switch kit that can be mounted close to the battery, for shorter cable runs, on cars with Motorsports ECU or PDMs. This unit is triggered by a push button switch which can be remote-mounted in the location specified by the rules, in multiple locations. Cartek isolators are designed to meet FIA requirements for electrical master kill switches. When a push button switch is pressed, the XR Isolator sends a shut-down signal to your ECU or PDM to positively turn the engine and sub-systems off before it cuts off the ground connection to the battery 1/2 second later. Solid state construction means no moving parts and no potential for sparks when the switch is operated. The XR isolator can be triggered by any number of normally closed, momentary-break switches (push button or toggle), connected in series using standard hookup wire (18 gauge). Just push the button to kill the system. A latching (on-off) switch located near the driver will reset the system. One external kill switch and one internal on-off switch are included with the isolator. The XR Isolator can be used with 7 to 18 volt electrical systems (with negative grounding). The battery switching circuit can handle a constant 450 amp battery load (2000A surge capacity). Draws just 25 mA when on and 0.1 mA when off. Designed and manufactured in the UK by CARTEK Motorsport Electronics for professional racing use. Read more about this unit here. The installed XR unit is shown above - its actually very light and easy to wire in. We have many more details about the CARTEK battery isolators at this link.